Reese McClain in one of my favorite pictures ever. When we started this blog we had two purposes. The first was to keep up with family and friends about our journey with Reese McClain. But the second more important purpose was to help other families as they discover and research their new journey with a special needs child. These days one of the first things any parent in our generation or younger does is to Google for answers when it comes to their children. Having a medically fragile child with special needs, causes you to stay up for all hours of the night researching new studies, new blogs, and reading complex medical journals. It can sometimes be very overwhelming and downright scary. When we first discovered Reese McClain’s had MECP2 Duplication Syndrome, we searched the internet for answers. We found some medical research, a few good blogs, and a very helpful facebook group. We’ve learned a lot these past 2+ years and we’re still learning every single day. We thought we would give our experience with a special needs and medically fragile child. This advice is from our experiences with our journey and these opinions are our own. Our experiences might be very different from yours, so please use our experience as a tool, not fact. Please comment below with any questions you might have. We’d like to start with the medical side of things. This is an area where I have surprised myself with overcoming my control freak fears of hospitals, needles, and doctors. A while back Elizabeth and I were becoming overwhelmed with Reese’s situation and we sat down and decided that we needed to divide things up. I’ll be honest in saying that I was putting too much responsibility on my wife and not sharing the load. So we made the decision that she would handle therapies and I would handle medical. This has been by far one of the best decisions we’ve made when it comes to Reese. Elizabeth schedules and fights for Reese on the therapy side of things, she talks with therapists, follows up with that type of paperwork, and keeps the calendar for therapy. I’m very blessed to work for a company that is flexible with family life and lets me take care of Reese when I need to. I’m at almost all of her doctors visits and tests and I’m the one that most often takes her to the ER. Reese McClain and I are regular visitors at our local children’s hospital ER and we know almost every nurse and doctor by sight and they know us. We have found that the medical side suits me. I can handle doctors and nurses and I’ve learned to speak the language. Elizabeth has excelled in keeping all of Reese’s therapies organized and fighting the bureaucracy to get more services. This has also worked well for our marriage and our mental health in dealing with all of Reese’s issues. We cannot recommend this strategy enough. Our experience with Doctors have been amazing.They are saints, and they have blessed our family in so many ways. Yet doctors are not God. They are humans, they make mistakes, they don’t know everything, and they must be questioned. Reese has some amazing specialists that care for her and some of them have been with us from the beginning of this journey. A couple of her doctors are considered the best in their field and are nationally and internationally known. But through this journey we have had doctors who weren’t so great, we weren’t comfortable with, and we’ve had them replaced. This might sound like a tough thing to do but we will always do what’s best for our daughter. A doctors feelings and ego are none of my concern. I’m focused on Reese and her care, not a doctor’s pride. If you don’t feel comfortable with a doctor, find another one, even if you have to travel. Nothing is impossible when it comes to caring for your child. During the cold and flu season we occasionally have to stay for a couple of overnight visits at the children’s hospital so Reese can get her lungs cleared. It’s a process we’re familiar with but it’s not something we ever look forward too. When you are admitted to the hospital it’s important to learn the names of doctors and who ranks where. There is a pecking order in American hospitals for doctors and it goes something like this. Specialist doctors are the highest we will ever see. These are neurologists, pulmonologists, and cardiologists etc. 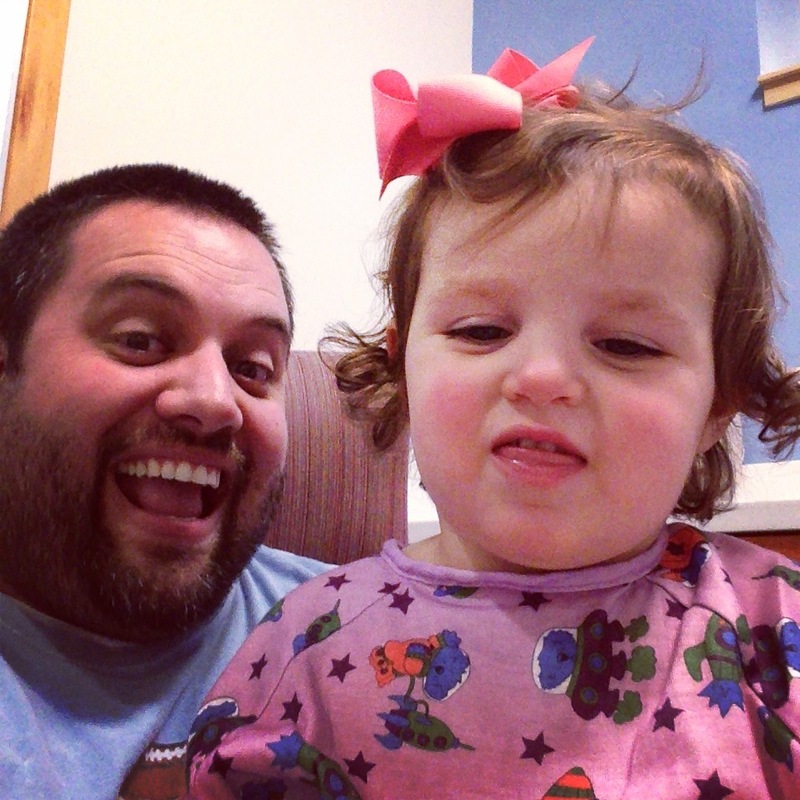 If Reese is hospitalized and any of her specialists are consulted, they can call the shots. Most of the time we do not see these specialists and we only see what’s called the Attending Doctor. This is the doctor who is legally responsible for Reese’s care while in the hospital. The attending supervises resident doctors, med students, nurse practitioners and registered nurses. The attending is the one who writes all the orders for medicines and treatments and has the final say when you are discharged. The attending is the one can make things happen. Back in 2012, Reese was on her 3rd visit to the hospital in less than 4 weeks. We had a bad experience in the ER and had been getting the run around for hours by different people as to what was going to happen with Reese’s care. I had to work that morning so my mom was staying with Reese and I had her put me on speaker phone with the attending doctor when she made her rounds. I was not happy and made my displeasure known. Over the course of the rest of that week, Reese was a top priority for a large team of doctors and the week ended with what’s called a care conference. This was 14 people made up of 8 doctors, 3 nurses, and 3 social workers who all got in a room with me to discuss keeping Reese out of the hospital. None of this happened without that attending doctor pushing for the care conference. She got things done and we are forever grateful for her that week. After attending doctors there are residents. When the attending doc does rotations they bring a crowd with them. In this crowd is usually a nurse or two, medical students, and first, second, and third year residents. A resident is one who has received the title of doctor for finishing medical school but is now in the stages of medical training. You will see the med students and first year residents (who are sometimes called interns) more than the other doctors. Always ask when they are in the room who is what. Third year residents are just one rung below the attending doctor and they can also make things happen. They are a great resource because they are usually close by if you need them. Also, just like most things in life, it’s all about relationships. We’ve gone back to the hospital a couple of years later and our third year resident was a first year resident when she first saw Reese. She loved us and took great care of us. Getting to know the doctors, asking who they are and learning about them is invaluable to your child’s care while in the hospital. Write down names if you have to, and make the effort to get to know the hospital staff. You never know when that personal relationship might come in handy. The backbone of any hospital is the nursing staff they are the people you have contact with the most throughout your stay in the hospital. I would say that about 98% of the time we have great experiences with nurses. They’re rockstars. But we have had that 2% who have a bad attitude, poor communication skills, or they just aren’t good at what they do. Nurses are the same as doctors, they’re saints and they are a blessing. Yet they sometimes are not up to the standards you hold for your child and it’s ok to ask for a different one. We’ve done this before and while it’s awkward, it has been necessary. Now granted we’re not picky, we’ve only asked twice out of the over 100 plus nurses we’ve had to be replaced. Both times were because of incompetence and not because of personality. You have to learn to deal with different personalities, but I will not compromise on my daughter’s care and you shouldn’t either. It’s a decision about what’s best for your child and you must get over everything else and focus on that. Finally in this very long essay, I leave you with some quick tips we’ve learned. Not all might apply to your situation, but they’re what we’ve experience. be nice and be thankful. Kindness goes a long away with doctors and nurses. always question the nurses about what medicine they are about to administer to your child, no matter if it’s by IV or oral. Do not accept that they have the correct medicine the doctor ordered. If you have a concern, ask to see the Doctor again before the medicine is administered. I could write even more about this topic but I hope I’ve helped this long overview. Being a parent of a medically fragile child is hard. The sacrifices you make and the journey you take are at times hard to swallow. It’s not easy to quarantine your child and home for a weeks at time and not venture out. It’s also not fun to make an ER visit for the 4th time in 7 days. 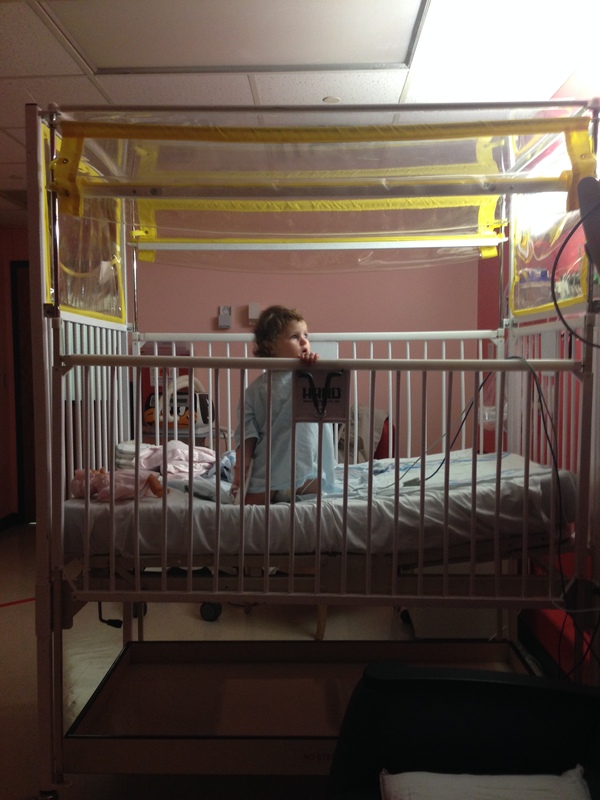 Watching your child lie sick in a hospital bed is one of the most helpless times of your life. Yet God is there with you every step of the way. He has a very big story to tell and you and your child are part of that story. Stay faithful and give all the glory to God. This is a two part post, next week Elizabeth will write about navigating the world of therapies and early intervention. She’s one of the best at it and our precious Reese McClain is blessed to call Elizabeth her mommy. Reese McClain completed her first week of 3 year old preschool! 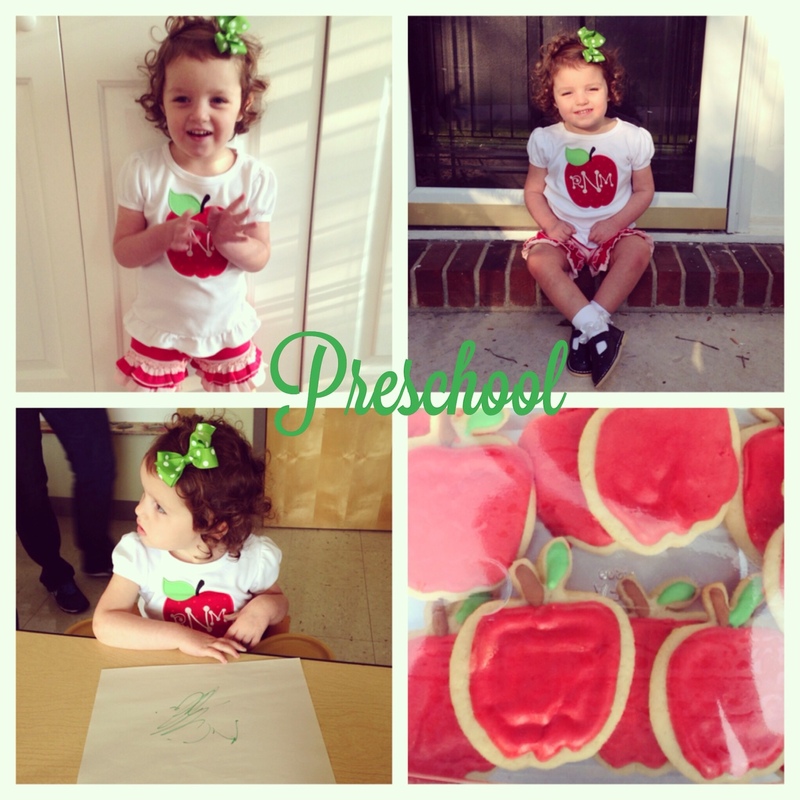 We are so thankful for her preschool and how well the transition is going for Reese McClain. She attends three days a week for three hours each day. The Carriage House accommodates special needs children and typical children in the same classroom. Carriage House mission: is a non-profit preschool program dedicated to the belief that children of all abilities can learn and make progress in an environment that is stimulating and nurturing, where individual differences are respected and celebrated. Today I had to take Reese McClain to Kosair Children’s Hospital for a quick outpatient test. It’s a routine one that is very familiar to us. In fact I have the routine memorized. You check in with the receptionist and wait for them to call back you up. They give you a digital signature pad and repeat the same thing every time….. initial here and here, sign here, relationship to the child here, and finally sign here. They ask if she has a latex allergy. Then you verify the child’s name and date of birth on the arm band. Then they place the band on Reese and another one my arm. Now I have very hairy arms and it’s always a delicate operation to get the arm band on my arm without ripping out what feels like hundreds of hairs. About the time I put on my arm band, Reese was getting restless in my arms and we had waited a lot longer than normal. I was frustrated, I wanted to get home, beat rush hour traffic, and watch the USA play in the World Cup. I was in my work clothes and hot from the 90 degree day. Honestly, I just didn’t want to be at this children’s hospital for what feels like the 100th time. Just then, a little boy with Downs Syndrome who couldn’t have been older than 5 years old, walked up to the nurse and wanted the same arm band Reese and I were wearing. His older brother was there for a medical reason and had an arm band but this little boy did not. The nurse asked his name and wrote it on the arm band and put it on his arm. He was so excited and had such an adorable smile that could light up a room. It was the tiniest gesture and the little boy acted like he had just been given the worlds largest pile of Legos. He got an armband just like his big brother and as far as he knows, this hospital just had a cool lobby with lots of toys to play with. Sometimes God reminds me that the little things are so trivial in this world but he still uses them to show us of his glory. I almost cried watching that little boy play without a care in the world and with such an innocence that was so heart warming. The same armband I dread to put on every time we visit, is the same arm band that made him feel just like his big brother. As I watched him, I thanked God for all he has given us. I had all the joy around me….the little boy’s smiles, my daughter’s laugh, her laying on my shoulder, and we weren’t even at the hospital to be admitted! Yet I was looking inward instead of recognizing what’s important. Getting home to beat traffic, impatience with a slow hospital staff, wanting to see a soccer match, and just thinking only about myself. Now through the eyes of another special needs child not my own, I see just a brief few of my self centered ways. It’s so easy to look inward and think my situation isn’t good. It’s also very easy to compare my situation to others and realize it’s not bad either. What’s not easy for me is to quit thinking about myself period. Our society is full of selfishness. We’re told over and over that we need to focus on ourselves with this drug, this drink, this place, this thing. Instead I should choose to be thankful and focus on what’s really important. Giving the glory to God and loving Jesus, my wife, my daughter, my friend, and my neighbor….not myself. I’ll let you in on one secret though, I’ll still be selfish because I’m a sinner. I’m not perfect and no one else is either. It’s a Genesis 3 world we live in and the only answer is turn to Jesus, confess our sins, and accept him as our savior. Be humble and accept that I will fall short of the glory of God everyday, but it’s through the blood of his son that I will someday live free of sin in the kingdom of heaven. I’d like to begin by thanking everyone for your prayers, phone calls, text messages, facebook messages and even tweets the past few weeks. We’re so blessed to have such a strong support community around our precious little girl. Reese McClain is doing great! We are off all antibiotics, we no longer are on breathing treatments, and are not using her vest at this time. She was given a 100% all clear by her doctor and we cannot be more excited to have our little girl back to normal. 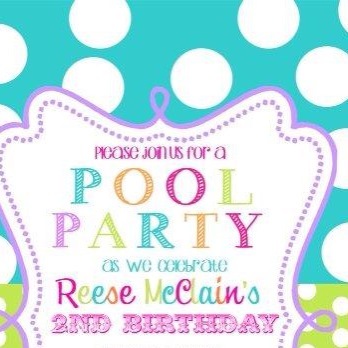 Reese McClain will turn 3 years old in July which is such a blessing to even think about. Our little girl is growing up and with her growth comes many challenges. While she crawls all over the house, she still does not raise to her feet to standing or even come close to attempting to walk. We pray those days are coming but we’re realistic in understanding we could be years away from her walking. She has as many therapies as we can get her into and she’s exhausted some days from all of her activity! Mommy and Daddy are determined our little girl will have every single opportunity we can afford. As Reese McClain grows we’ve begun to see the looks. Special needs parents know all about the look. I’ve in fact given the look myself because sometimes there is no way around it. It’s the looks of “That child is “special”, something isn’t quite right….wonder what’s wrong?” Since Reese does not talk and she does not wave her hand, most people just think she is being shy. It’s then when she looks up at someone and gives them the biggest smile ever, that everyone delights in her response. At times though, you can see the questions people have, Reese has the stereotyping of her hands bent inward, she sometimes bounces around and waves her arms uncontrollably with excitement. She sometimes rolls her eyes back into her head and will stare at bright lights on the ceiling. It’s all normal to us but not normal for someone to see the first time. The other night at a Japanese restaurant one of the hibachi cooks asked (after observing Reese for a good 20 minutes) if she was 6 months old and we said yes. Sometimes it’s just easier for us to say yes than to explain. Sometimes other people will ask my favorite “what are the terrible 2’s like? Is she a handful?”. It’s those questions that make us laugh because we honestly have no idea what the so called “terrible 2’s” are like. Reese McClain is a child who for 99% of the time is happy. When she does fuss it’s because she’s hungry or sleepy. We wouldn’t know what a temper tantrums looks like in our home. In some ways it’s a blessing, in other ways it’s just awkward. Yesterday we were at Trader Joe’s and Reese was in the cart watching the man behind us in line. He was just a normal guy who we could tell was quite shy with Reese. He didn’t make faces really, he just smiled at her and he looked away. Reese thought this man was either a funny guy, or funny looking. She kept laughing at him so hard it was almost a cackle.. We laughed, he gave an awkward smile, and even the checkout girl was laughing. It’s times like all of these that we must remember that Reese is made in God’s image, not ours. We don’t know that man at Trader Joe’s story. He could have been having a good day or a bad day. We don’t know what God was using Reese for yesterday by smiling and laughing at him. We do know this; the world will think of her as “special” but God looks at her as one of his children to care for, a blessing from him. 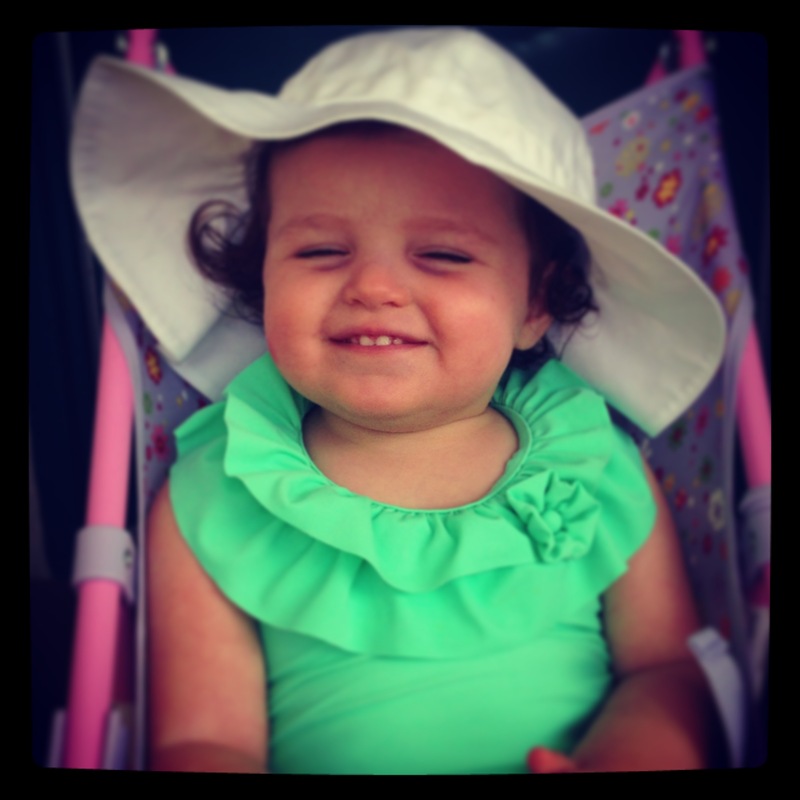 She laughs, she smiles, she claps, and she loves on her Mommy and Daddy every single day. We rejoice in all of these things as we pray she gets stronger and stays healthy. God has a plan for Reese McClain and while it’s awkward sometimes and it’s funny other times, we couldn’t be more thankful for all he has given us through our precious daughter. Amen! 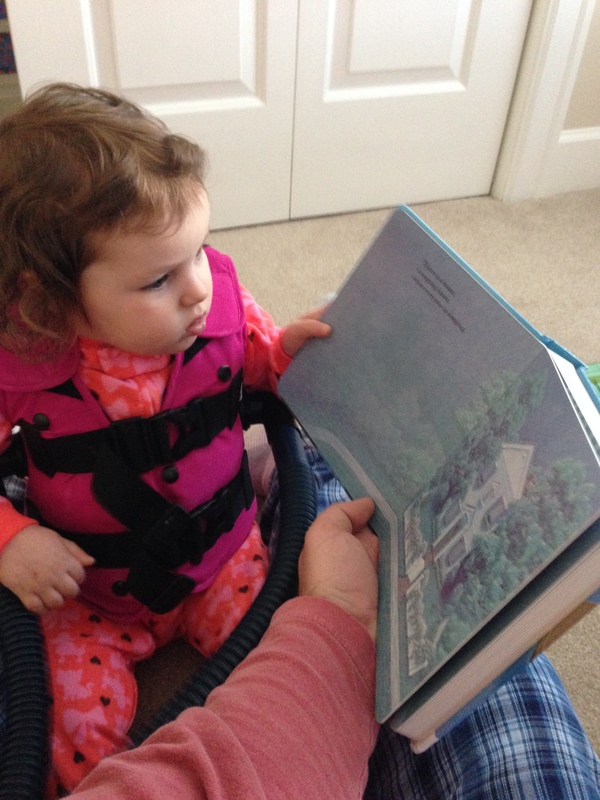 In our last post, Elizabeth wrote about Reese fighting RSV. Unfortunately, this week it developed into a more severe respiratory infection and it required Reese to be hospitalized. When we took her Tuesday night, we knew immediately they would admit her. Her O2 levels were low enough while she was awake that we knew they would fall dangerously low when she slept. Thankfully, they admitted us to the same respiratory floor we have always visited at Kosair Children’s Hospital. We ended up having the same attending Doctor we’ve had from our previous visits and even the 3rd year resident we remembered from back when she was an intern just 2 years ago. While it’s no fun to visit a children’s hospital often enough that you are known by nurses and doctors, it’s nice to have comfort and fellowship with the medical staff. She’s trying to break out! She wanted to crawl around so bad. 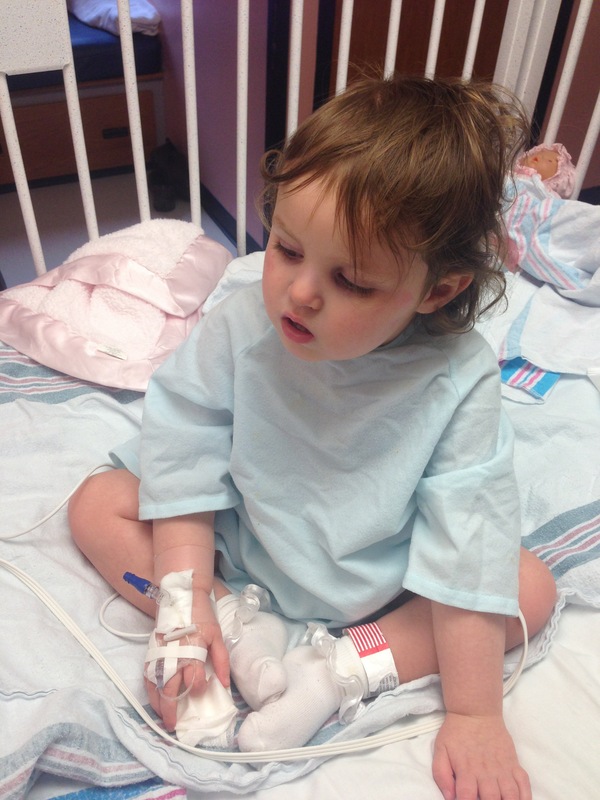 On Wednesday, Reese McClain’s O2 levels were high enough that they took her off oxygen. She slept through the night with no need for O2 and we were discharged Thursday! God is good! The doctors think that because of her growing strength, she’s able to cough more of the fluid from her lungs and recover faster. In the past when we were admitted, we were there for at least a week! We pray that her growth and strength continues. We are now home and have been told by the doctors to not travel with her for the next 7 to 10 days. 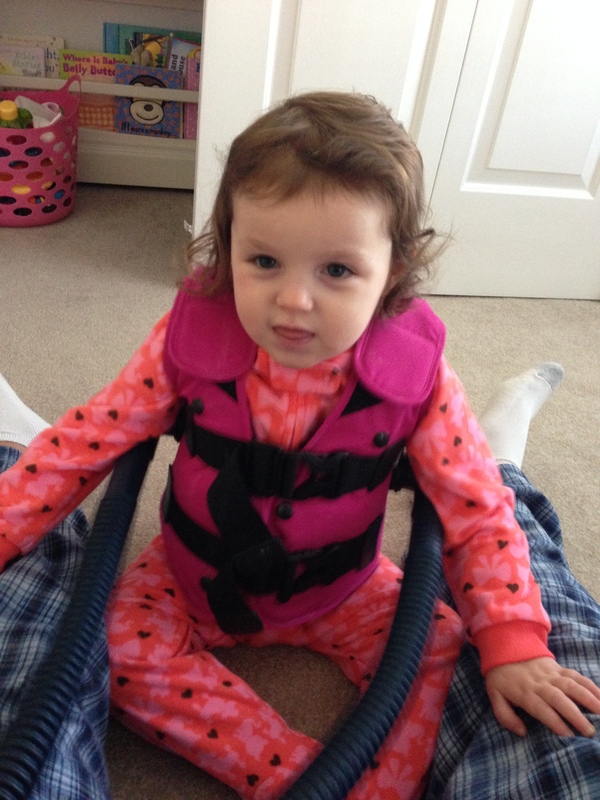 She needs her respiratory vest and breathing treatments 4 times a day. She’s also on a 10 day antibiotic. While keeping her home for over a week is not fun, we know we must focus on her health and look forward to warm weather! It’s thumper time! That’s what we call the respiratory vest. Reading one of our favorite books, The Napping House. Not only has the trials with Reese been our focus this week, we’ve also dealt with sorrow. This past Saturday my grandmother Lucille Nichols passed away at the age of 92. It was not unexpected, she had been in assisted living for almost 3 years and her health was failing. She was such a strong woman with a heavy influence on my life. After my mother, she was the women who helped raise me more than any other. 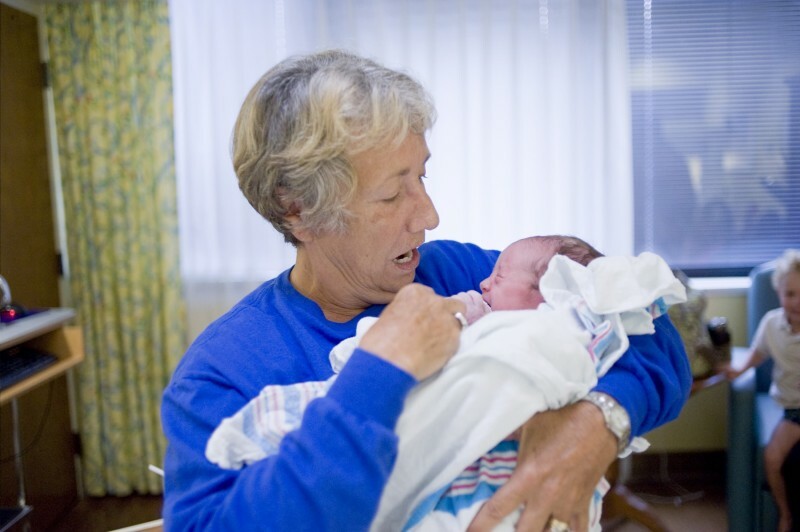 She raised 4 strong Nichols sons of her own and had 7 grandchildren and 4 great grandchildren. She lived a long life full of work, fun, and her family. She loved her family more than anything and spoiled us grand children as much as she was allowed. We’ll miss our Granny but we take comfort in knowing that she was a believer. She is now with Jesus and there is no where else she would want to be. Granny holding Reese on her 90th Birthday. Reese was only 6 months old. God’s plan for us in this world is sometimes very hard to understand but his plans are always for his glory. That was proven once again this week in another passing of a very important woman in our lives. 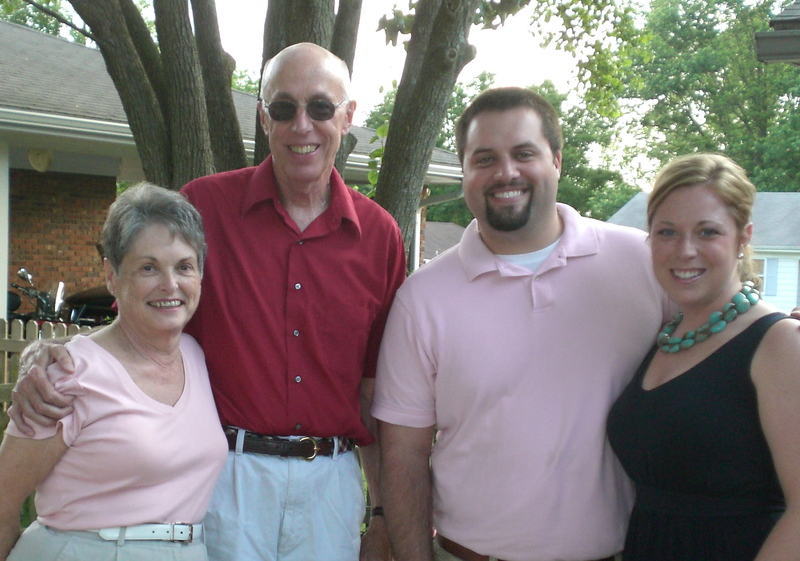 This past Tuesday morning as we were to prepare to bury my grandmother, my parents longtime next door neighbor Gay Hower passed away at the age of 76 from a brain tumor. I have lived next to Gay since I was born and she and her husband Tommy are like my second grandparents. Their house is next door to my parents and the path between our homes has been worn down so much after 25 years, that we finally had to put in a sidewalk. They are the type of neighbors that you can escape to as a teenager when mom and dad are being annoying or you just want someone to talk to. It’s the type of home where I talked politics, sports, current events, and laughed about anything and everything. They hosted a wedding shower for Elizabeth and I when we were married and their 53 years of marriage was a great example to us of what a strong biblical marriage should be. Gay was one of the most sincere and thoughtful women I have ever known. I loved her for her sharp tongue, quick whit, and her ability to listen. There were many times when she gave advice I didn’t want to hear or tried to ignore, but she was never wrong. She loved my brother and I like we were one of her own and we will all look back on our time with her with very fond memories. I know she is in heaven singing praise and glory to God. This past week we have cried, we have stressed, we have worried, we have mourned, we have laughed, and we have prayed. My continued prayer is that I will tell everyone that God has a plan for his glory, and it will always be good. We have been so blessed with a healthy winter and last night Reese McClain was diagnosed with RSV. Kyle took her to the ER and when they got home I took over with breathing treatments, medicine, suction and bath time. We will continue to give breathing treatments and suction around the clock. 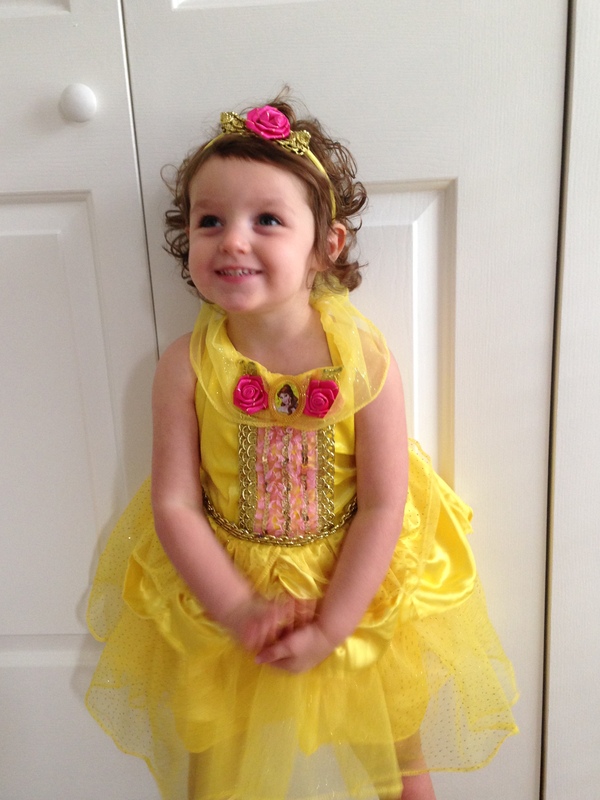 We hope our little girl will be back to her smiling and active self soon! A very dear friend of mine sent me the link to this sermon a while back but I just recently had the opportunity to watch–WOW! I hope you take the time to listen to this sermon because I think everyone could find something valuable from God’s word. I will share that he mentions parents of special needs children feel that their child will be invisible to this world. I have to say that is one of my fears for Reese McClain. You hear of parents worrying, complaining about all the activities their child is involved with or how they hope their child gets this or that scholarship/job/position–the list goes on and on. I sit there thinking–I wonder if Reese McClain will even be noticed in this world, will she have a purpose. Then I slap myself back into reality and realize that all those are “worldly views” and those that the world sees as least is who God sees as most. Reese McClain cannot communicate “I love you mommy” or “I love you daddy” but I know when I say “Reese McClain do you love your mommy” and her face lights up, she smiles and let’s me kiss her face off–she does love me! I’m slowing learning that the value of a person has nothing to do with our ability but our heart/relationship with Christ. When the world tells you “perfection” is what is desired it’s really hard to see imperfection as perfection–but I believe that is what God wants us to do. Life gets so busy sometimes you just need to slow down and enjoy what is happening around you! Well, Reese McClain is crawling and we are ENJOYING!!! Her sitter (Juju) reported she saw it on August 16th and then that evening Kyle and I took RMN to PT in Louisville and Amy (therapist) reported that she crawled during therapy. Kyle and I were so excited even though we had not gotten to see her move in person. However, she started moving that weekend! It’s slow… but its progress. I feel like it’s the same experience we had with her sitting up by herself. 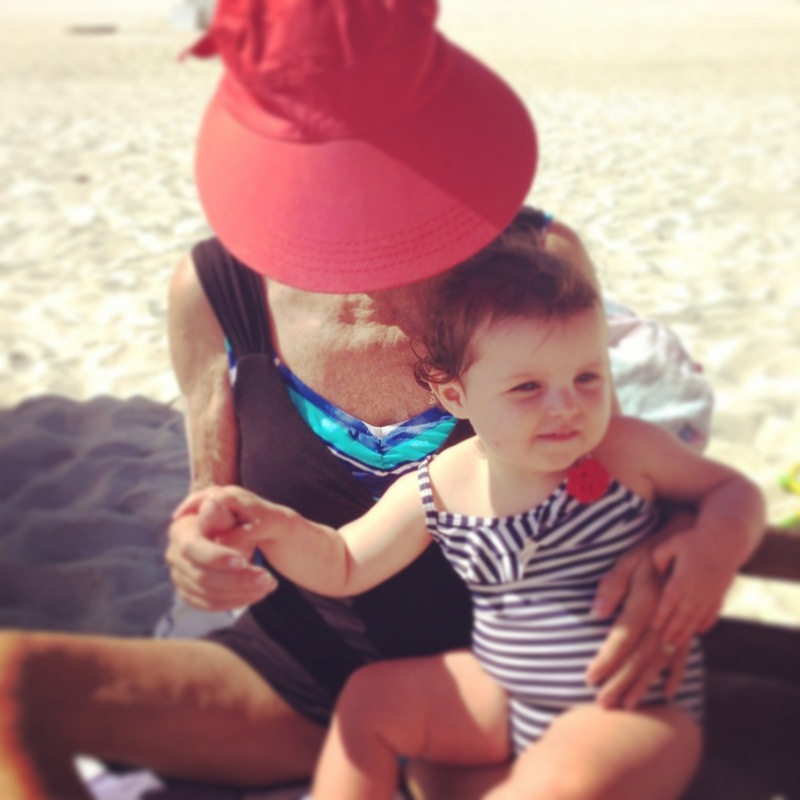 She would do a little… sometimes follow thru, sometimes not… but once she got the hang of it… she wanted to sit up all the time! I will never forget going to get her out of her crib one morning and she was sitting up clapping. I never thought that day would come… what a glorious day! I firmly believe that her moving is going to make her stronger and stronger. She is reaching and trying to pull up on doorways, chairs, coffee tables—which is also VERY exciting. I have had some ask “what do you believe has helped Reese”? The number one thing that I think has made a difference is prayer–trust in God. Thank you to each of our faithful friends for the continual pray for Reese’s progress–we cannot do this journey without you. I’m going to be real honest—trusting God is hard! For those that don’t know me… well, I like to be in control of things. I’m a planner, organizer and must be prepared going into situations. So, trusting someone who I cannot physically see or talk things out with in person… is hard! However, I continually relay on scripture and what the bible is telling each and every one of us. I read the other day: Salvation secures our lives for all eternity. Soul satisfaction ensures abundant life on earth. He satisfies you with goodness; your youth is renewed like the eagle. Psalm 103:5 We each can find goodness in God no matter our situation I never in one million years thought I would have a special needs child or been in and out of the hospital with a child like I have experienced but I continually tell God–You have an amazing plan [one much bigger and better than mine] and I must trust you. 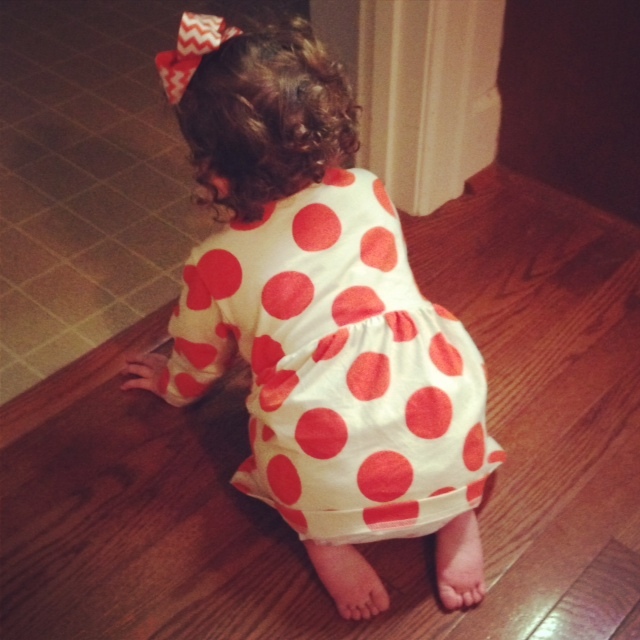 The most precious little view ever–Reese McClain on the MOVE! There are just some days/events/holidays that will remind me of my Grandmother. The Shelbyville Horse Show is one of those events–my Grandmother and David went every night, every year and it was “their” event. My Grandmother would plan all of July what she was going to wear–she always looked stunning! As I write this it brings me to tears because since July 16th there has not been a day that goes by that I don’t think about her or wonder what heaven is like or her. 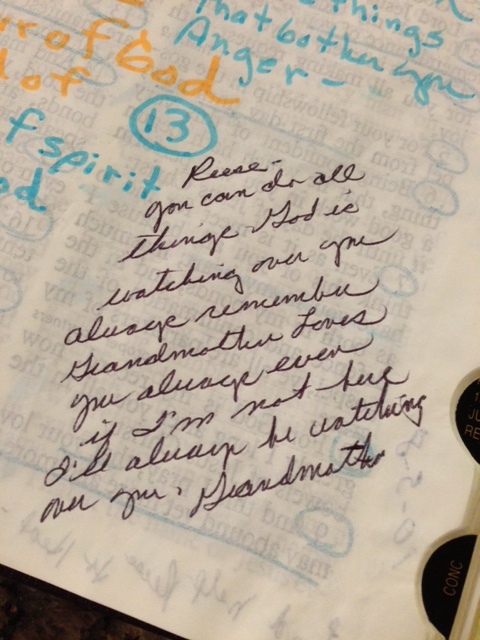 For those that know me–my Grandmother and I were extremely close! When you think “Grandmother” many think old but my Grandmother was young (69) and vibrant. This time last year she was taking care of Reese, making my bed, making sure Reese had every pink item known to man and so much more! There really is no one that can replace my Grandmother in my heart–she was a one of a kind lady. It is not fair that she her life was shortened or that she won’t be there for the birth of my next child. I continue to pray for God to reveal his glory to me with the passing of my Grandmother. I just love the two photos below (birth of Reese thanks to Lizzieloo)… she stayed in the delivery room with me until the very last few minutes and switched off with my sister. I got the shirt she is wearing in this photo and hope to one day make both Reese and I something very special since that was a very special day for us–O’ how I loved having her with me to help with Reese and teach me how to be a good mommy. That brings me to funeral advice. The most comforting thing that people can do when one dies is to share a happy story about how their love once touched their life or something they remember about the person. 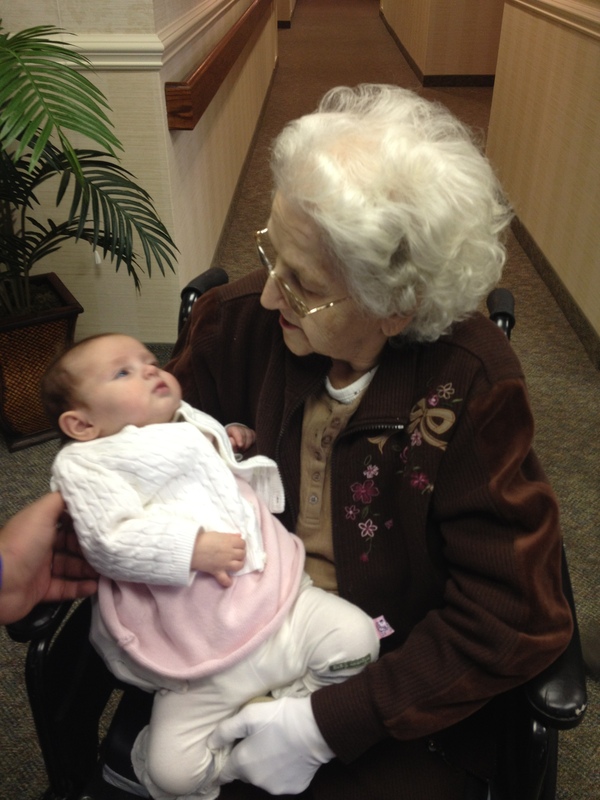 I loved hearing stories of about my Grandmother during visitation–it was so touching. So many people loved my Grandmother and thought she was a special lady. More importantly countless people said “she loved her grands” and I know without a doubt that is true. 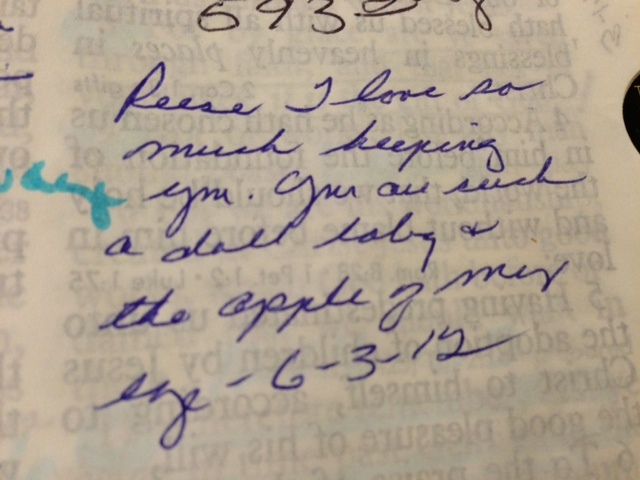 She got to spend 33 years with my sister and 30 with me–what a blessing! So, next time I go to a visitation and I know the person that passed–I will share a memory with those they left behind because I found it the most comforting thing one did for me. 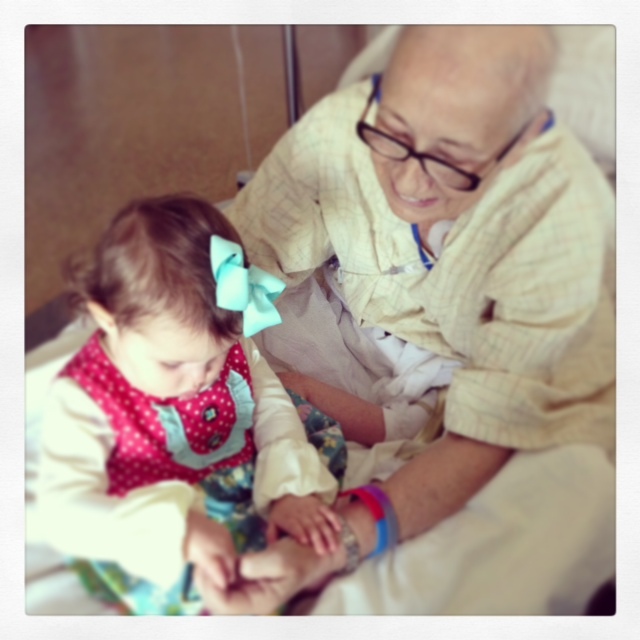 Grandmother you have been so influential in my life–you’ve helped mold and shape me into the woman I am today. I cannot thank you enough for all you’ve done for me and for Reese–doctors appointments, hospital stays, picking her up from Sproutlings… the list goes on and on. I will cherish all those times you got to spend with Reese and use the many things you’ve taught me like “only good mommy’s lotion their babies” “cover dr. smith’s all over their bottoms” for my next child. You have always been so encouraging about Reese and helping me feel like she is perfect and all is right in the world. I am having a picture printed of you holding her and it will be in her room forever! I have so many memories of you that I will never forget… like when you would let us run up and down the aisles of Wal-Mart, sitting in church with you and your purse was full of goodies, giving us a dollar for offering, taking me on a shopping spree one summer to Ann Taylor Loft, buying Matilda Jane that you say is ugly (lol), making sure Reese had every pink item known to man, being in the delivery room, being at my 30th birthday party– just being the most amazing Grandmother anyone could ever ask for. 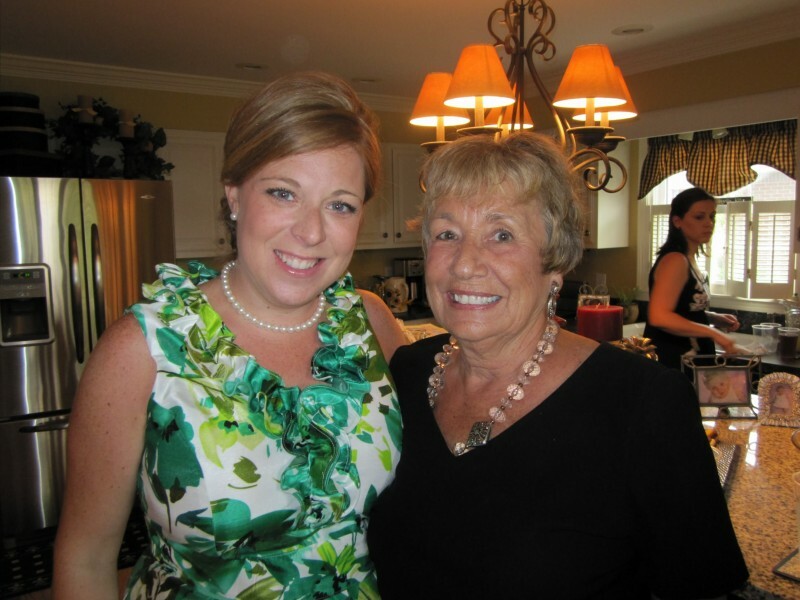 You truly have set the bar high Grandmother–you are such a beautiful person inside and out! I’ve never been more proud to tell people that Judy Sparrow is my grandmother! I know you are in so much pain and it hurts me to see you that way. I’m so sorry that this cancer has been a monster to you. I do know that the pain won’t be there in heaven. You have read all my blog posts so you know I think about heaven a lot. I think its nothing to be scared about at all, in fact I know I will see you there one day. I believe we will be in the most perfect form and that will be amazing. 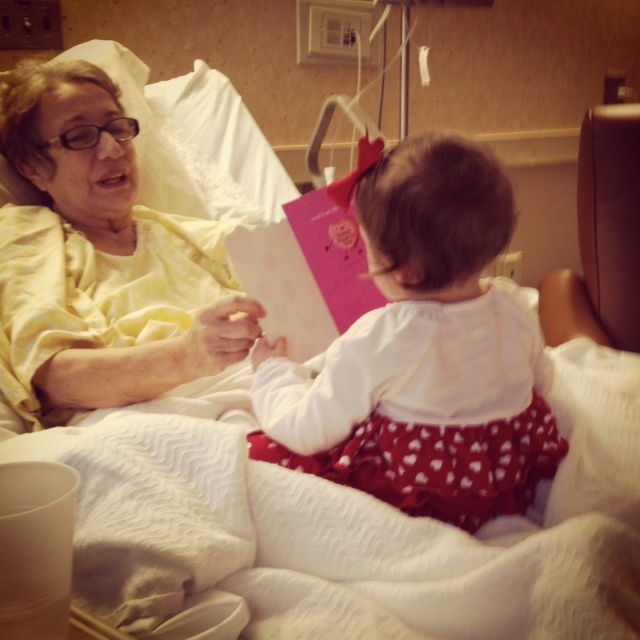 Grandmother, know that I have prayed for you continuously since you first got sick. God does answer our prayers but just not in our time. His plan is so much bigger than ours… just like Reese….. if she never walks on earth I know she will run to me in heaven saying “mommy, i love you”… The bible tells us that we will know people in heaven and so I will look forward to that day I see you in heaven and of course if my Reese McClain gets there before me I know you will watch over her. Romans 8:18– For I consider our present sufferings of this present time are not worth to be compared to the glory that is revelved to us. 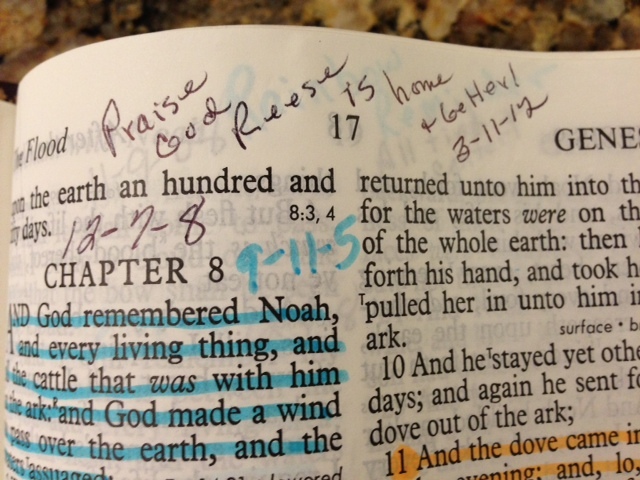 I think heaven will be a continual worship service in the most beautiful place imaginable… pearls, gold …. breathtaking really. Philippians 3:20-21 But our citizenship is in heaven, and from it we await a Savior, the Lord Jesus Christ, who will transform our lowly body to be like his glorious body, by the power that enables him even to subject all things to himself. Grandmother I love you to the moon and back. Your fight has been inspirational. I know you’re tired and I am at peace now with you leaving… but again, I know it won’t be forever until we meet again! I love you sweet Grandmother please know Kyle, Reese McClain and I will never forget you. I would give anything to spend one more day with my Grandmother but I know she wouldn’t want to come back if she had the option because heaven is so wonderful. I catch myself thinking she is like on a vacation and will be back soon so we can chat. I go to her grave side trying to wrap my head around that her body is in the ground but she really is in heaven. I listen to her voicemail she left for Reese that says “Reese it’s Grandmother, it’s Grandmother. Tell your mommy to call me so I can talk you to sleep” over and over and over. What I continually go back to is that our present sufferings do not compare to what he will reveal to us, I will see my grandmother and know her again one day, she is no longer in the excruciating pain that she endured and ultimately this life is all temporary so live each day likes its your last. Since my Grandmother’s passing of pancreatic cancer I have heard of others diagnosed of it and just pray for them and their families. It’s one ugly cancer. May each of them and their families find peace with our Lord and Savior. 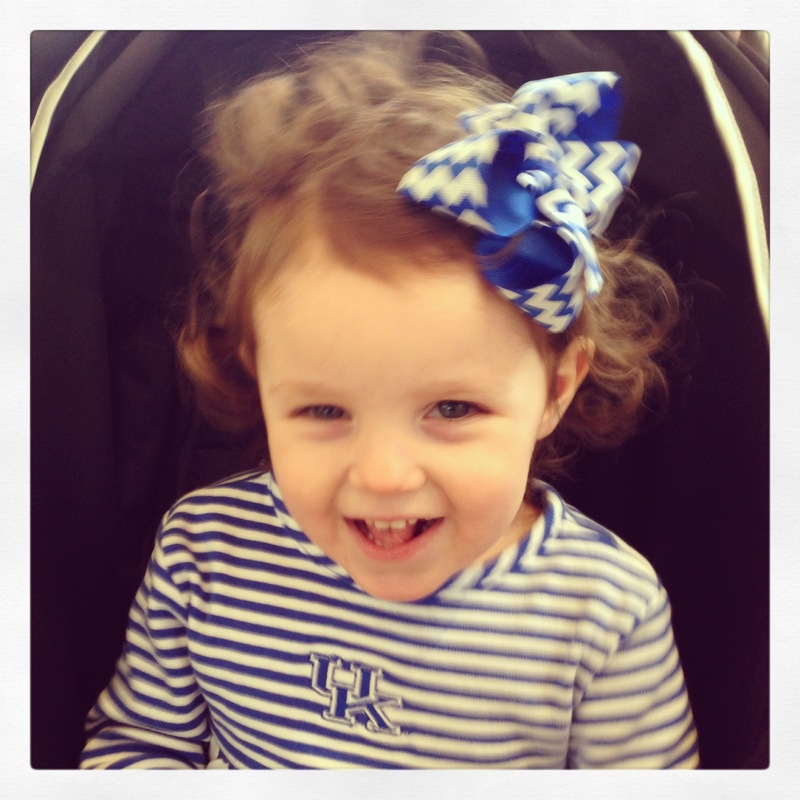 It has been a while since I have written an update on little Miss Reese McClain. She will be 2 this month—where has time gone?!? Of course, birthday party planning is in full swing! Reese has managed not to be admitted into the hospital this past winter/spring and she is still doing really well. We have had 3 ER visits for constipation/UTI something that she battles continuously. We thought we had the constipation thing figured out but then she progressed with her foods and we are back to square one. However, she has really made some steps forward in eating. She will take the spoon/fork from me and feed herself! We are working on her pulling the utensil out of her mouth so when I do hand over and hand—I say “out”. Hopefully, when I say “out” she will remove the utensil rather than me assisting her. She was on all fork mashed foods but now she is doing soft foods that don’t have to be mashed. She is chewing foods great and we couldn’t be more excited about her progress. 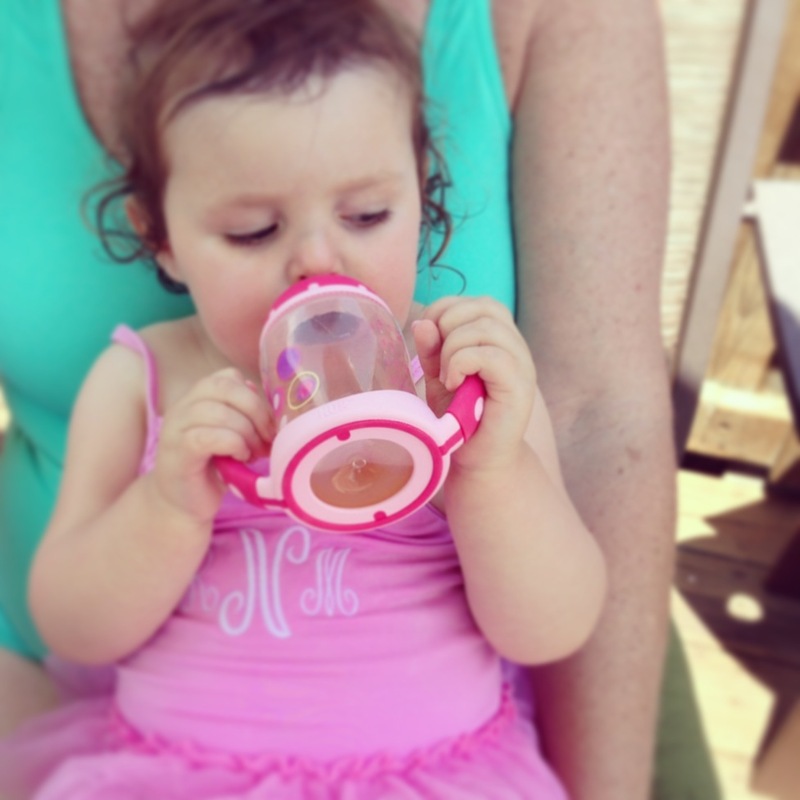 She is also holding her sippy cup which is a huge accomplishment. We have to add thickening solution to it for now but our goal is by the end of the year to be off of the thickening solution. Reese still takes a bottle before bed—Soy formula and out of a bottle. We are going to transition that formula to a sippy cup in the next month. We are not sure how much longer she will be on formula but for now it helps with her calorie/nutrient intake. Reese is sitting up by herself from laying position. She rolls everywhere and is getting up on hands and knees (position to crawl). Reese is getting stronger everyday and I know it won’t be too much longer before she is crawling! She is still receiving PT 3-4x’s a week, OT 1x a week and speech every other week. 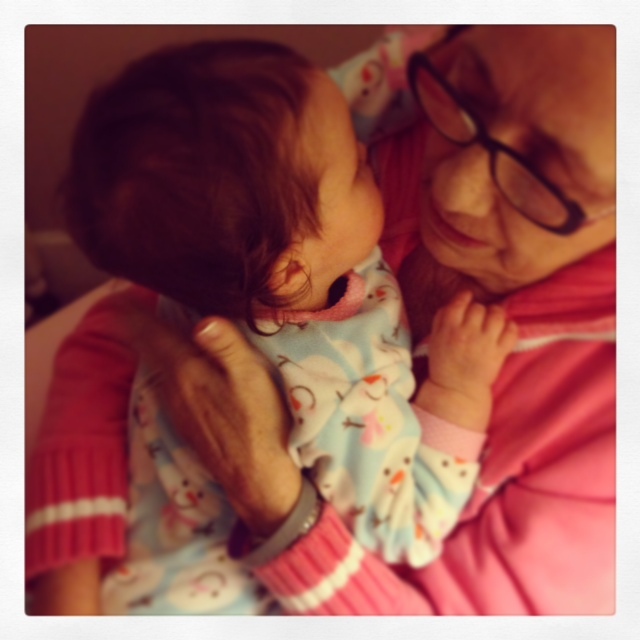 Besides our daily routines we have been spending lots of time with my Grandmother. She was diagnosed with Pancreatic Cancer this year. 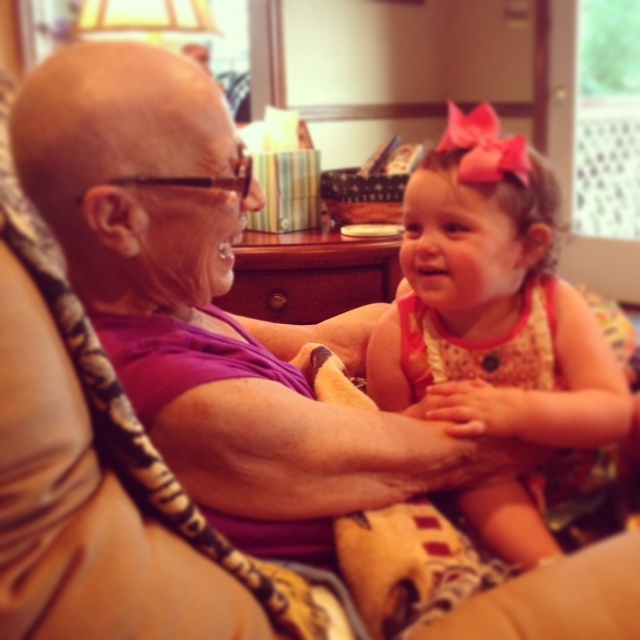 Reese loves her Grandmother—she smiles and belly laughs at her every time we visit!